When we talk about the IntraWeb application types, we are basically talking about deployment, ie, how you can install your IntraWeb application to be available to your users. Otherwise, all IntraWeb application types are the same. The main goal of the SA Server is to allow the developer easily deploy the application, without all the issues of installing and configuring a web server like IIS or Apache. As the SA Server includes its own web server (it is a Indy based web server), you can simply execute the application and it is ready to receive requests and send responses. When you execute the SA Server, you see a small UI, which can be used by the developer for debugging/testing purposes. 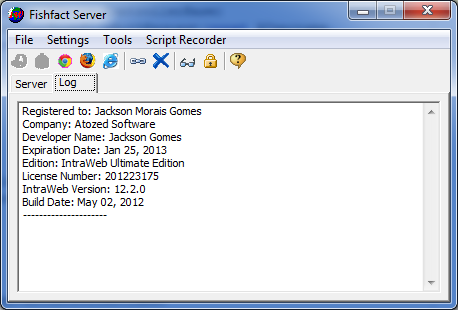 Using this GUI, the developer can test the application in a specific browser (the GUI will enable the buttons of the installed browsers only, see Browsers Support on the Server Contoller advanced topics), simulate speed connection, run the appplication with specific URL parameters (click on the Server tab on the GUI), as well as monitor the active sessions and the number of bytes sent by the application. Although this UI is very handy for debugging, it is not the best option for deployment. The SA Server has the ability to run as a Windows Service and you should use this option for installing (deploying) your application on your server. For information about deploying a SA Server, please check Deploying your application as a Stand Alone Server. As your SA Server includes a web server (an HTTP web server), you need to choose an exclusive TCP port for your application to receive requests. The default port is 8888 and you set this value on the Server Controller class. The default port for HTTP is the port 80, but this port is usually assigned to IIS. If you don't have or don't need IIS running on the same server as your IntraWeb application is installed, you can change the port on the Server Controller to 80. As this is the default port for HTTP communication, your appplication will not have any problems with firewalls, proxy servers and specially if your application is running within a network that has strict rules regarding TPC ports. If the port 80 for your server it is being in use, please certify that your network allows traffic on the port you choose (talk to your network administrator). See Stand Alone Server Deployment for more information. For a ISAPI DLL,you need to setup IIS (or Apache) to host your application. See Deploying your application as a ISAPI for more information. The main advantage of ISAPI deployment is that you don't need to worry about which port your application will be listening to. As you are running under IIS, all connections are made on Port 80 and IIS can host multiple ISAPI DLLs, all of then listening on the same port 80.